To precipitate the excitement, this is the fairytale part about coqs. Sofia bought this little fellow on the streets of Lisbon and he traveled with us. To my eyebrows move, she told me, yes yes, like in Amelie. All my word-cladded questions (Is it something that many people do? Have you taken this thing on a road before? Does it exist in other nationalities?) resulted in no answer and Sophie’s smile. I know this smile too well to ask more. Cork is a different story. Many things in Portugal are made of cork. Cheese trays, message boards, bags, shoes, let your imagination run wild. I guess it was brought up to this level of consumption during the Discovery Time. (Discovery Time is a term used in Portugal to refer to a vast, and quiet vague in terms of historical boundaries, period of time when the country was a center of the exploration activities and economic life around them. Use case example: “the mansions built during the Discovery Time”, “the porcelain factory is very old, from the Discovery Time”.) Another mention of cork during this trip is linked to a Portuguese guy Sophie was interested in at some point. In a book on astrology which we might have read during our trip, the advice for capturing this guy went along the lines of “open a bottle of a good wine. He will be yours until the cork dries out”. Might very well be true for a Portuguese. We started exploring Lisbon from its rooftops. I have to say, despite my best efforts on getting some key information before my trips, our discovery missions with Sophie are never well planned. 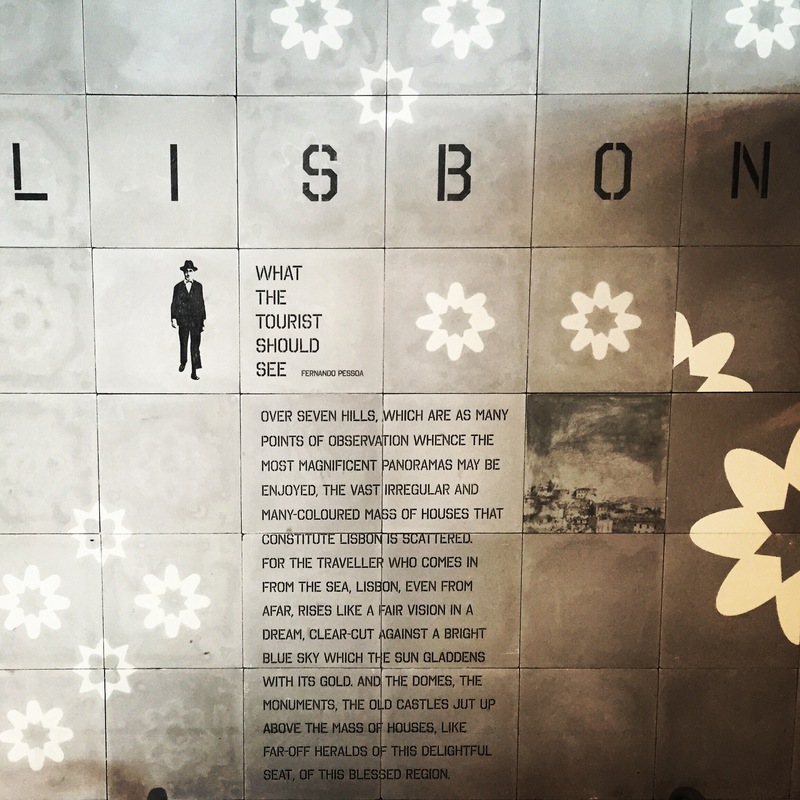 This time as well, our knowledge about Lisbon was limited to what I imagined it to be. So after a morning at the pool, we went to the hotel concierge and got a tourist map and a few words of wisdom. Our main source of useful information, however, turned out to be an Uber driver, Joao (after I paid three time the trip price to a taxi driver with a meter, we resorted to Uber as a more reassuring option). Joao advised us to change our original route to Rossio square and brought us instead to Graçia’s Miradouro (so we don’t need to walk up the hill and pay for the castle’s entrance for to see a wall and the same view). We still did the castle later though. It was also from Joao that we learnt about the key events of this weekend in Lisbon (and easily the highlights of the season): eating sardines, collective marriages in San Antonio church and the carnival. Sardines are apparently a local delight (and it was the most expensive weekend to eat them, according to our self-appointed guide). The small fishes are served on a piece of bread each and then cleaned from the bones and consumed in a long festive meal. Best served with beer or wine, depending on your taste, as Joao mindfully suggests. Collective marriages in San Antonio church is a traditional event when waves of couples are married eight at a time in a ceremony free of charge. The event attracts crowds of people and a local TV coverage all day long. I prefer to think that there are other advantages than cost cutting but Joao told us of none. The carnival is a Rio-like parade. A very small version of Rio parade. People come to secure the best places several hours before its start at 10 pm and everyone is delighted to see the participants carrying all kinds of strange, really, objects like flower beds, guitars, ship, name any that comes to mind. This part we did not get. Naturally, we found our way to Belem (it was one of the things I imagined about Lisbon and it is also on the Lisbon Starbucks mug, which I collect). Belem was perfect: graceful, peaceful, relatively free of tourists at this sunset hour, exceeding our expectations. The guide book sights of Lisbon are of course great (even the castle turned out to have more than a wall). The main fascination of Portuguese capital, however, is in its streets, squares and dead ends. Lisbon is one of the cities that is best explored without a map and a precise plan (perfect for me and Sophie). It is also the best way for some amazing shots. Back to the fairytale script, peacocks.There are many of them in the castle (told you there was more than a wall). I will leave you with a picture of this glamorous boy only, not to bring back Sophie’s disappointment at uneven beauty distribution between males and females in the animal kingdom. To my surprise, Lisbon turned out to be rich in street art. I mean, we all know about the modern art potential of Berlin, Copenhagen and Barcelona but Lisbon is totally underrated in this regard. The city has so many amazing combinations of covered in dust of ages walls with modern glass construction on top of it, it is just a pure delight. And then some. And, of course, I can’t help but mention, we have discovered local beverages. A lot of them: wine, cherry liquor, mohito, caipirinha, beer and all at 1 euro. Any time of the day (I am thinking now about a stand that theoretically served crêpes for breakfast but had all kinds of liquor on display), on every corner of the city, in all kinds of combinations. Remember? Open a bottle of a good wine. The real Portuguese fairytales though happen in Sintra. But that’s a subject o a separate blog post (and one of Joao’s stories). I love Lisbon! So on the cork – we were just in Portugal in April / May and I noticed on our drive from Lisbon to the Algarve that a lot of trees seems to be missing part of their bark. I’ve always learned that when you remove bark from a tree that it kills it. So I was curious about that and these numbered markings on the trees. It turns out that they are CORK trees! I never realized that cork came from bark but apparently it does. https://en.wikipedia.org/wiki/Cork_(material). No way! I did not know there are cork trees, to me it was more like a material thing. Good to learn, and I somehow hope it still does not kill the trees, no bag/ shoes/ anything really is worth it. From what I read, it doesn’t kill the trees – that’s why they tag them with numbers because they only take the cork every so many years. I had no idea why there was so much cork either and just got curious about all the trees that looked almost burnt. So we’ve both learned something new! Lol, mindreader, Sintra is coming online soon! That’s where the real fairytales are!